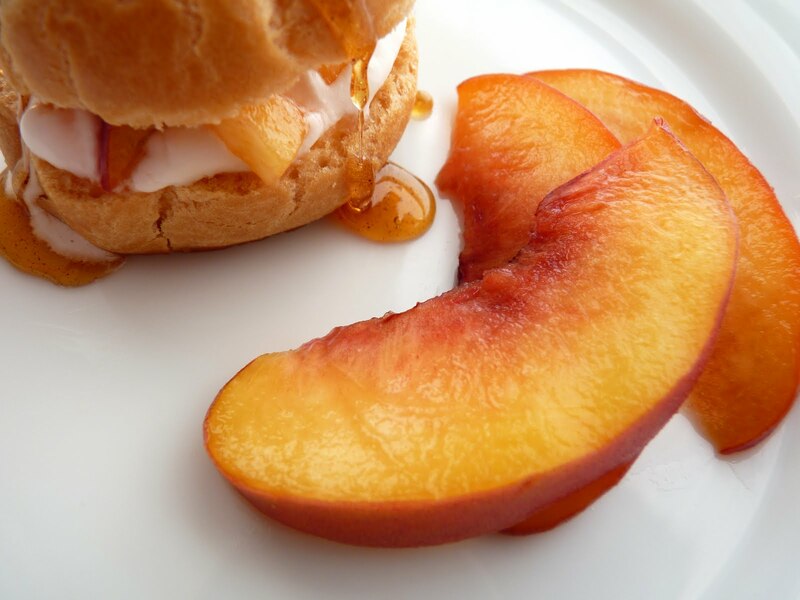 Peach season is rapidly heading for a finish, so it’s definitely the time to enjoy every last bite. 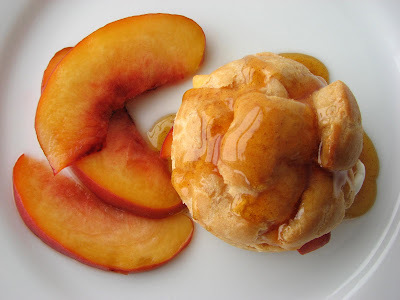 This is a simple cream puff recipe made more fun by layering in some luscious peaches and drizzling with a thin caramel syrup that’s been nicely spiked with a pinch of cinnamon. Just a little dressing up of the cream puffs you may have coveted as you passed by the windows of your local bakery. Cream puffs are made from a classic pastry dough, pâte à choux. This is the same dough that forms the base for profiteroles, which are filled with ice cream rather than whipped cream, and éclair, oblong shapes filled with pastry cream. Once these are piped and in the oven, I always anticipate the experience of opening the oven door and finding the thick dense dough transformed into all these light beautiful billowy puffs. In some cultures the dough is fried to create churros and one type of beignets. For this dessert, I bathe the peaches in a light mixture of honey and lemon to flavor and keep them from browning. 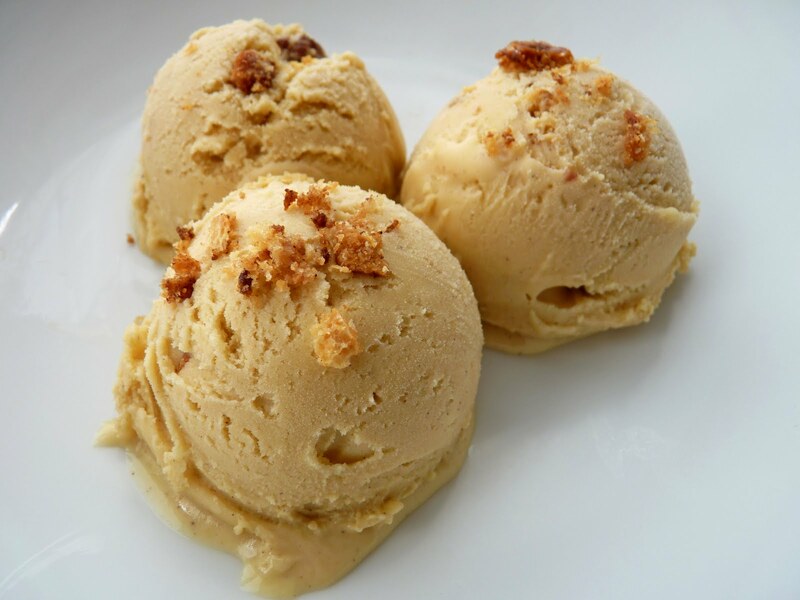 The cream is whipped with either a dash of vanilla or a nip of brandy or rum. Once the puffs are baked, this dessert is very quick to assemble and even quicker to devour. Enjoy these last waning days of summer while you can. Celebrate the end of another gorgeous season with a platter of these elegant little gems. 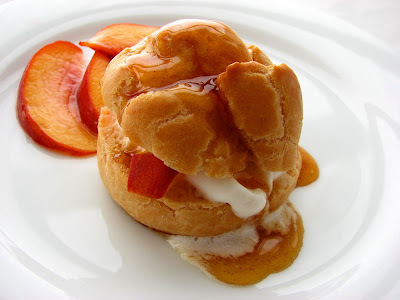 - Pâte à choux is not difficult to make. It just requires that you try not to hurry the process. What makes it all work are a few simple techniques: 1) Once you add the flour to the simmering water and butter, make sure you stir constantly and cook the dough for a couple of minutes so there is a steam rising and a film appears on the bottom of the pan. 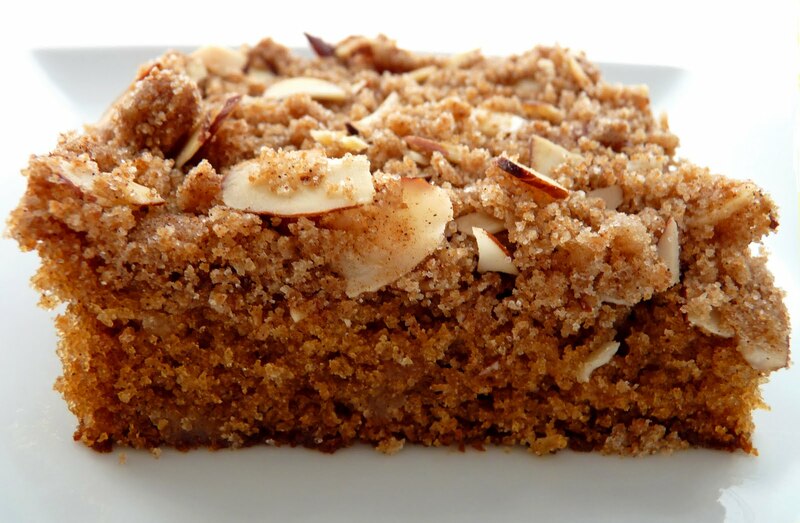 This cooks out the taste of the flour. 2) Take the dough off the heat and beat it in a mixer on medium speed or with a wooden spoon until there is no longer any trace of steam rising. This helps to dry out the dough in preparation for incorporating the eggs. 3) Add the eggs 1 at a time and mix thoroughly before adding the next. The dough will look lumpy at first but will smooth out beautifully. Scrape down the bowl after each addition. 4) The pâte à choux is ready when it is smooth and shiny and falls from a spoon in gloppy sheets. 5) Always use an egg wash to ensure even, pretty browning. 6) The test for baked pâte à choux is when the pastry feels very light and sounds hollow when tapped. - Baked pâte à choux are best eaten the same day but you can also freeze them in an airtight container. Thaw and crisp in a 350 degree oven for about 8 – 10 minutes. - As always with caramel, give it your undivided attention. It will turn on you in a second! Try to take it to a medium dark amber color to avoid it being too sweet. Take it off the heat the moment it just begins to reach the right color, swirl the pan very gently until it darkens a bit more from the residual heat. Then quickly set the pan down and add the hot water to stop the cooking. And remember, whenever you add an ingredient to hot caramel, it’s going to bubble and splatter viciously. Just stand back and let it unwind. Adding a hot liquid helps to cut down on the reaction. Adding cold ingredients to hot caramel will likely cause it to seize on you. 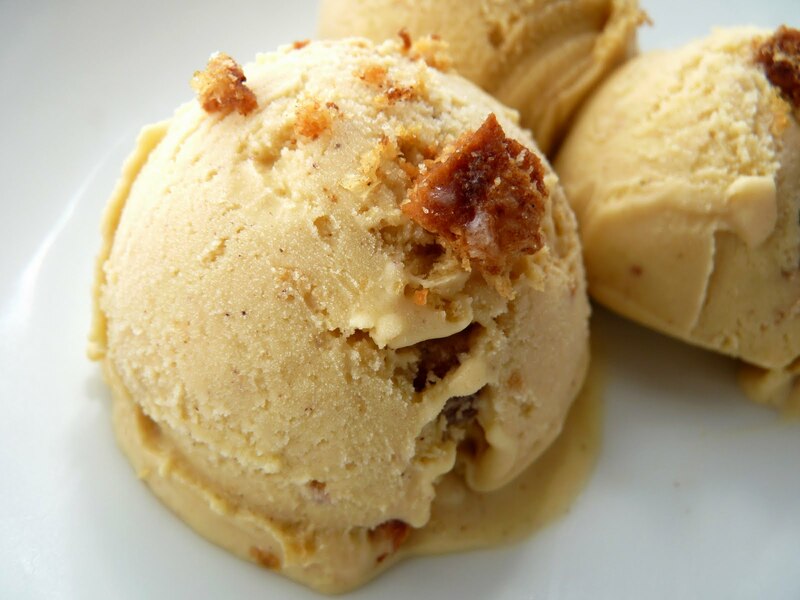 To fix a seized caramel, place it on low heat and whisk gently until dissolved, being careful not to splash any on your hands. - You will probably have leftover caramel syrup, which will keep stored in a glass container at room temperature for a couple of weeks. 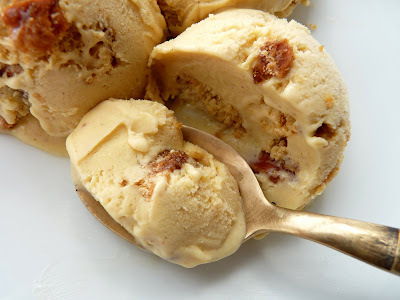 Spoon it over your favorite ice cream. Pour the mixture into the bowl of a stand mixer and beat with a paddle for a few minutes until there is no longer any steam rising from the dough. Beat in the eggs one at a time, beating well after each addition and scraping down the bowl. The dough will go from looking lumpy to very smooth. Continue to add the second egg and beat until you have the same results. While the dough is mixing, prepare the egg wash by whisking the egg, water and just a few grains of salt. Line a baking sheet with a silpat or parchment. Place the pâte à choux into a pastry bag fitted with 1/2" plain tip. Pipe a dozen 1 1/2" mounds. Wet your index finger with cold water and smooth the tops of each piece of piped dough. Brush each piece lightly with egg wash.
For the caramel, place 1/4 C water and 1 C sugar in a saucepan on medium high heat. Cook the sugar mixture just until it begins to turn a medium dark amber color. Watch it closely. Once the sugar starts to color it accelerates very quickly and will darken to a burnt and bitter stage very fast. If it's not coloring evenly, gently swirl the pan just a bit to circulate the darker areas. As it begins to approach the right color, take it off the heat and swirl the pan gently. Keep it off the heat and let it continue to darken a bit more. It will have a slight reddish cast. Once it looks like the right color, set the pan down, stand back and add the 1/2 C of hot water. It will bubble up vigorously and splatter, so be careful. When it settles down, return it to the medium heat and let it come to a boil to dissolve any seized bits of caramel, stir carefully without splashing. Remove from heat and pour into a bowl. Stir in the vanilla, cinnamon and lemon juice. Let it cool several minutes and then add salt to taste. Set aside to cool completely. For the peaches, place the honey and water in a saucepan and warm over low heat until dissolved and blended. Remove from heat and add the lemon juice to taste. Cool. Slice about half the peaches and cut the remaining into a small dice. Toss all the peaches with the syrup to coat each piece. Set aside. When ready to assemble, whip the heavy cream with the sugar and vanilla (or the brandy or rum) until it holds a very soft peak. Slice the puffs in half. Dollop some whipped cream on the bottom half. Top with diced peaches. Place the other half of the puff on top and drizzle with Cinnamon Caramel. Add some sliced peaches to garnish the plate. Serve immediately. 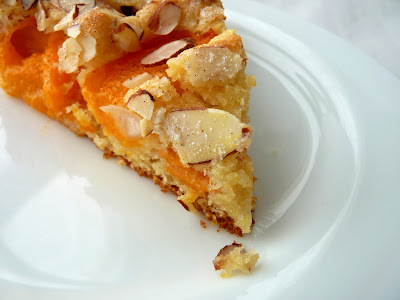 As we begin our shift into fall, I somehow managed to score some end-of-the-season apricots last week and have baked them into this yeasted tart. 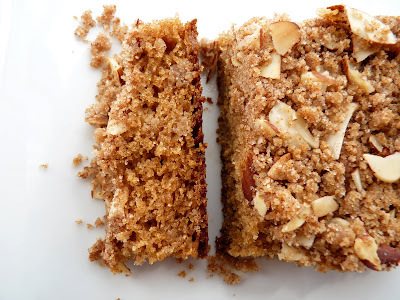 It makes for a great brunch offering or afternoon cake with exactly the right amount of yeast, butter, vanilla, sugar, salt and of course blessed fruit. 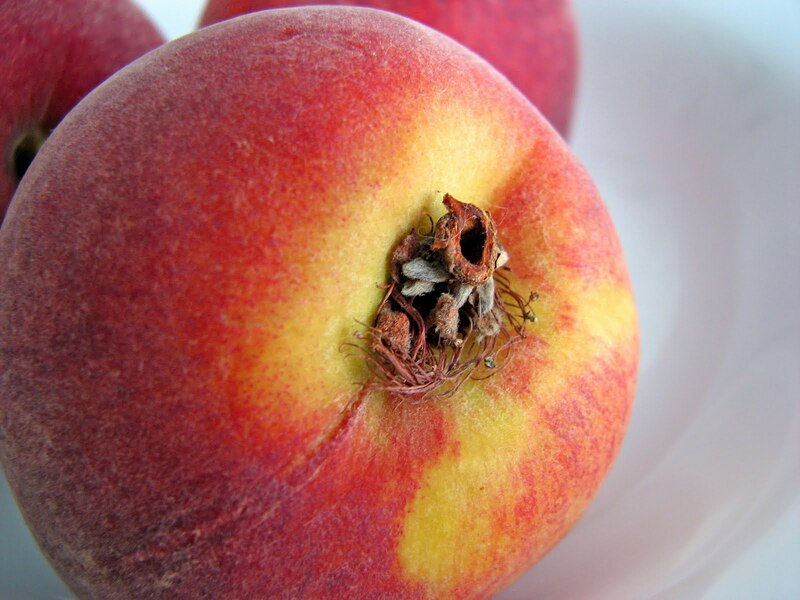 As the weeks go by, you can substitute the last of the peaches, plums or pears. If you fear working with yeast, this may be the recipe for you. The dough comes together very quickly and without any scary temperature testing or guessing. Just combine all the ingredients and about 3 minutes later you’re done. 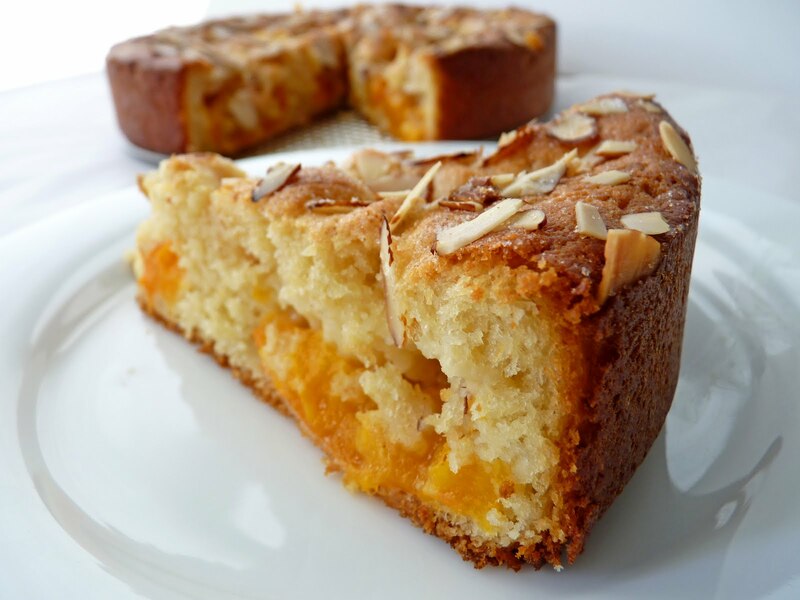 Give it two hours to rise, layer some fruit, garnish and give it another 30 minutes rest. Bake it and there you have it: a deliciously fresh little tart that will leave you ever so grateful for the wonders of yeast. - Adjust the sugar you sprinkle on top of the tart according to the fruit you use. Tart fruit like plums will require more, about 1/4 cup. - When yeast dough is set aside to rise, set a timer. One sign of over-proofing is when you press the dough down after the first rising, the gases discharged will have a strong smell of alcohol. Stir together the milk and the yeast in a mixer bowl and then combine with 1/4 cup sugar, eggs and vanilla. Add the flour and salt and mix with the paddle for one minute. Add the room temperature butter and continue beating for another minute. Gather the dough and place in the prepared pan. Cover with plastic wrap and place in a warm space to rise for 2 hours. Dampen your hands a bit and gently press down on the dough. Spread it out to cover the bottom of the pan evenly. Arrange the fruit slices in a decorative way over the dough, leaving a 1/2” border all around the edges. Press the fruit down firmly. Sprinkle sugar over the entire surface and let the tart stand for 30 minutes. Preheat your oven to 350 degrees. 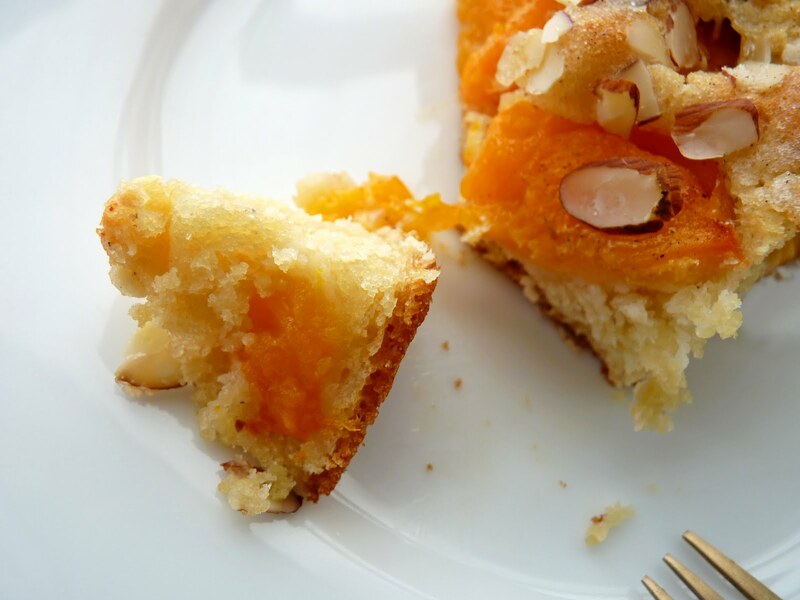 Bake the tart for about 35 minutes or until the tart is lightly browned the center feels slightly firm to the touch. Cool on a wire rack and remove from pan. It’s hard to ignore the stunning bright beauty of grapes. They beam like clusters of jewels on market tables everywhere, their effortless beauty urging us to make the investment. There are so many wonderful varieties to pair with artisan cheese for a little something different and wonderful. In this recipe, I roast the grapes with a loving splash of olive oil, a bit of sugar secured with a dash of cinnamon and a pinch of sea salt. As they roast, their skins split and they become juicy and sumptuous. The olive oil doesn’t overwhelm the taste at all but rather gives the grapes a luscious mouth feel. 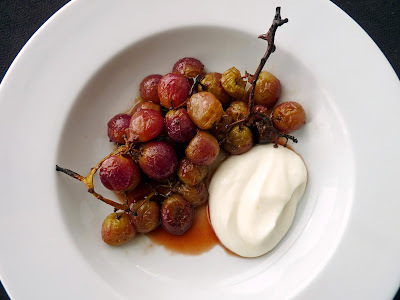 I serve these roasted grapes with a dollop of Greek yogurt that has been mixed with a little honey and vanilla and expanded with a little bit of cream. The result is simple and beautiful and tastes like something you’d sample on the shores of the Mediterranean as you stare out into the deep blue sea. 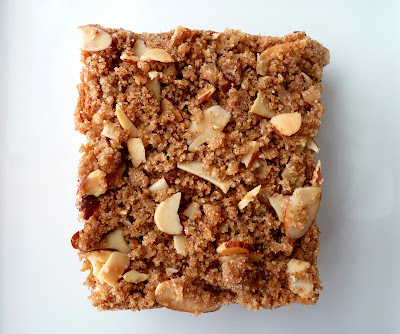 These are clean and robust flavors that come together in about 15 minutes. Pull up a chair and nibble at this light plateful of summer. - Choose grapes that are seedless and full of flavor. I like red flames but I’m sure there are other varieties that would also be delicious. - It might be fun to add a splash of orange flower water to the yogurt cream instead of vanilla. - These grapes would also be delicious with a bite of your favorite cheese: blue, goat, triple cream. - The salt is a nice contrast to the essential sweetness of the grapes. - This would be a good dessert to serve with a nice Beaumes de Venise or Muscat, Monbazillac, Semillon or Viognier wine. For the Yogurt Cream, whisk together the yogurt and honey. Fold in the whipped cream. Chill. 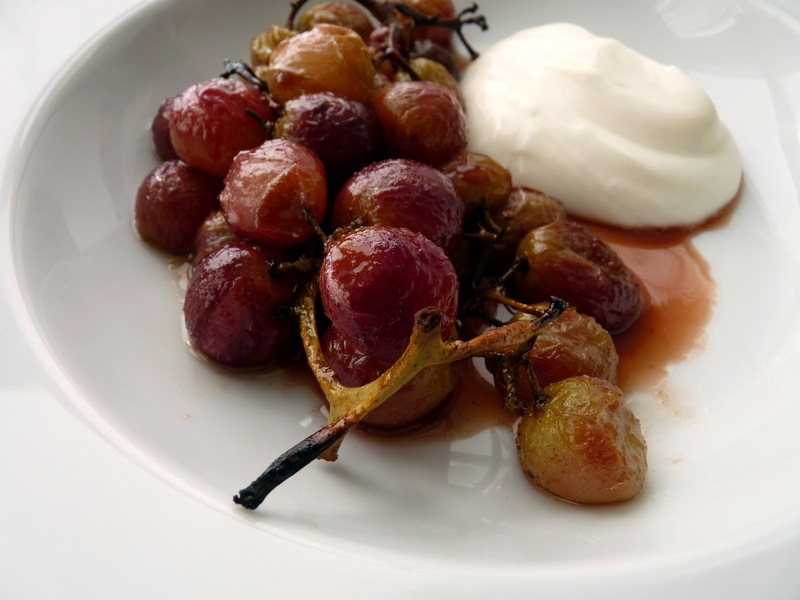 For the Roasted Grapes, preheat the oven to 450 degrees. Cut the grapes into small clusters and place them in a bowl. Drizzle with olive oil and toss with your hands to coat evenly. Combine the sugar and cinnamon and sprinkle the grapes. Sprinkle with sea salt. Place the grapes in a glass pie plate or shallow baking dish and roast in the oven for about 15 – 18 minutes, until the grape skins show signs of cracking. 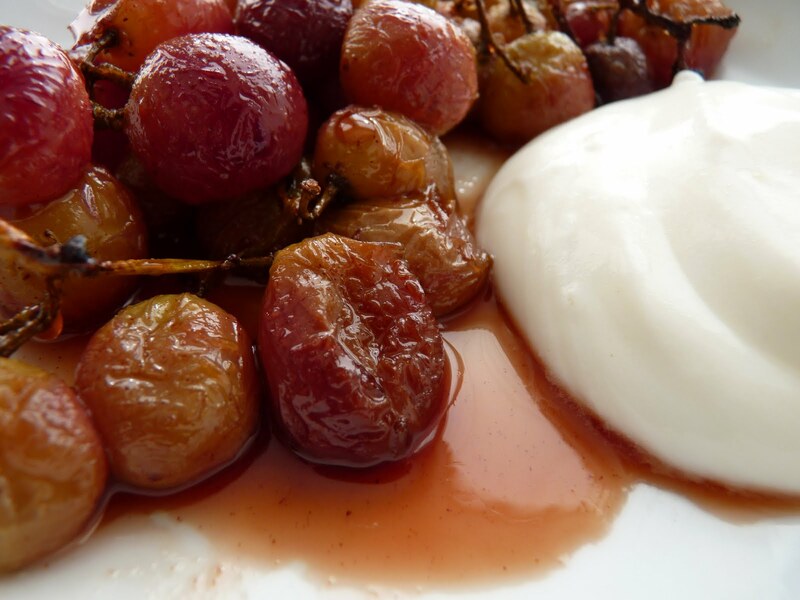 Plate the grapes, drizzle with their juices and serve with a dollop of Yogurt Cream.